In cases of PTTD that have progressed substantially or have failed to improve with non-surgical treatment, surgery may be required. For some advanced cases, surgery may be the only option. Symptomatic flexible flatfoot conditions are common entities in both the adolescent and adult populations. Ligamentous laxity and equinus play a significant role in most adolescent deformities. Posterior tibial tendon dysfunction (PTTD) is the most common cause of adult acquired flatfoot. One should consider surgical treatment for patients who have failed nonoperative therapy and have advancing symptoms and deformities that significantly interfere with the functional demands of daily life. A titanium stent (HyProCure) is inserted into the ankle joint under minimally invasive techniques to stabilise and re-aline the ankle to reduce the degree of flat footedness by creating an arch. Studies have shown this procedure has a success rate of 94%. Unlike major reconstructive flat foot surgery, it can be reversed where the stent is removed without any ongoing complications. This technique is used for well reducible flat foot by limiting motion at one or two joints that are usually arthritic. This is indicated for late stage II adult acquired flatfoot and the flexible adolescent flatfoot. This procedure will address midtarsal instability, restore the medial longitudinal arch and reduce mild hind foot valgus. This technique is indicated for late stage I and early stage II PTTD with reducible Calcaneal valgus. 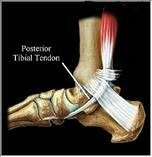 This is often combined with a tendon transfer. A PCDO is also indicated as an adjunctive procedure in the surgical reconstruction of the severe flexible adolescent flatfoot. On their own these are not very effective but in conjunction with an osseous procedure, soft tissue procedures can produce good outcome. Common ones are tendon and capsular repair, tendon lengthening and transfer procedures. Flat foot correction requires lengthy post-operative period and a lot of patience. Your foot may need surgery but you might simply not have the time or endurance to go through the rehab phase of this type of surgery. We will discuss these and type of procedures necessary for your surgery in length before we go further with any type of intervention.